Homeopathic remedies for Dry Skin are totally free from any side effect and act as a natural source to nourish the skin, remove the dryness and replenish the skin’s normal texture. Everyone dreams of having a flawless and smooth looking skin but it is not just the looks that are impacted if the skin rough and cracked, it is also your skin health. As winter approaches, most people notice their skin turning dry and scaly. This can make fine lines and wrinkles more noticeable and can cause itchiness that may even be accompanied by bleeding. Dry skin is medically known as xeroderma. 1. Weather. Skin tends to be driest in winter, when temperatures and humidity levels plummet. But the season may not matter as much if you live in desert regions. 2. Heat. Central heating, wood-burning stoves, space heaters and fireplaces all reduce humidity and dry your skin. 3. Hot baths and showers. Taking long, hot showers or baths can dry your skin. So can frequent swimming, particularly in heavily chlorinated pools. 4. Harsh soaps and detergents. Many popular soaps, detergents and shampoos strip moisture from your skin as they are formulated to remove oil. 5. Other skin conditions. People with skin conditions such as atopic dermatitis (eczema) or psoriasis are prone to dry skin. · Are in your 40s or older. The risk increases with age — more than 50 percent of older adults have dry skin. · Live in dry, cold or low-humidity climates. · Have a job that requires you to immerse your skin in water, such as nursing and hairstyling. · Swim frequently in chlorinated pools. 1. Atopic dermatitis (eczema). If you're prone to develop this condition, excessive dryness can lead to activation of the disease, causing redness, cracking and inflammation. 2. Infections. Dry skin may crack, allowing bacteria to enter, causing infections. These complications are most likely to occur when your skin's normal protective mechanisms are severely compromised. For example, severely dry skin can cause deep cracks or fissures, which can open and bleed, providing an avenue for invading bacteria. 1. Moisturize- To make up for the lack of moisture in the air, religiously apply moisturiser over your skin after having a shower. This helps hydrate the skin and keeps the moisture in your skin from escaping. 2. Right Moisturiser- In most cases, creams work better than lotions when dealing with dry skin. Creams that contain natural oils such as olive oil or jojoba oil work well to deep moisturise dry skin. Other ingredients your skin cream should contain are lactic acid, urea, lanolin, petrolatum, hyaluronic acid etc. 3. Shower wisely- Limit your showers to a maximum of 10 minutes and try to use warm water instead of hot water. Though standing under a hot shower may feel good at the moment, it rids the skin of its natural oils and hence dries the skin. 4. Use Gentle Soaps- A cream-based soap that is fragrance-free is great for dry skin. This soothes the skin and moisturizes as it cleanses. 5. Protect Your Skin- Limit your skin’s exposure to natural elements in the winter. If you must step out, clad yourself well and be sure to put on a pair of gloves and socks. Limit tasks that need you to wet your hands. 6. Shave Smartly- Shaving not only removes unwanted hair but can also irritate the skin. The ideal time to shave is after a shower as this is when your hair is most pliable. Also, always use a sharp, clean blade and shaving cream or gel to protect your skin. 7. Get a Humidifier- A humidifier can help regulate humidity levels within your house. However, excessive humidity is not good either as it can also adversely affect your skin. 8. Apply Coconut Oil- Coconut oil is rich in fatty acids that make up for the loss of moisture in the skin. The ideal time to apply coconut oil on the dry skin is before going to bed or after having a bath. 9. Be careful about laundry detergents- The soap being used to wash your clothes may not always be completely washed off. This can irritate sensitive skin and cause itchiness and flaking. When choosing laundry detergents pick one that is hypoallergenic. 10. Wear fabrics that love your skin- Avoid synthetic fabrics that stick to the skin and instead, pick gentle fabrics like cotton or silk that allow the skin to breathe. In case you have a concern or query you can always consult an expert- www.dr-ronakshah.com & get answers to your questions! 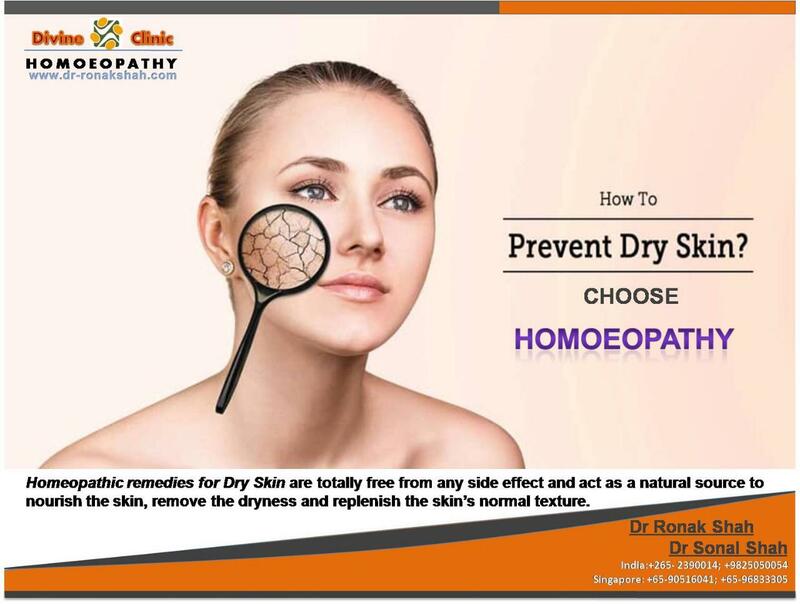 Homoeopathic medicines are effective for dry skin and its associated symptoms. They are safe, no side effects and cure the condition permanently .Some of the important remedies are given below. 1. SULPHUR 200-Sulphur is one of the top remedies for dry, itchy skin. Sulphur is effective for both itching and dryness of skin. Sulphur is prescribed where the skin is excessively dry and itchy. Itching leads to scratching and itching usually worsens at night Sulphur is effective for a burning sensation in skin. The skin also looks very dirty and is very unhealthy. An aversion to bathing may be noticed in people needing Sulphur. This Homeopathic medicine will help to get rid of itching as well as dryness of skin. 2. ALUMINIA 200- Aluminia is another effective remedy for dry skin where the skin is chapped and dry tottery. There is intolerable itching when getting warm in bed. The patient scratch until it bleeds, then it becomes painful.Brittle skin on fingers. 3. PETROLEUM 200-Petroleum is the best medicine to deal with dry skin occurring in winter. The main symptoms for the use of this remedy are dry, rough and cracked skin. The skin feels harsh to touch. Petroleum, thus, is the ideal Homeopathic remedy for dry skin in winter season and is of great help in restoring the normal texture of skin. Petroleum also gives excellent results in persons who have cracks on hands due to extremely dry skin. The skin is sensitive and rough to touch. The cracks can be deep enough to cause even bleeding. 4. ARSENIC ALBUM 200-Arsenic alb is prescribed for dry skin with itching , burning and swelling. The skin is dry, rough and scaly which is worse from cold and scratching. The patient have great anxiety and restlessness. There is a thirst for small quantities of water at short intervals. 5. BRYONIA ALB 30-Bryonia alb is effective for dry and chapped lips. Cracks appear on lips and Bryonia heals the chapped lips and restores them to their normal state.Another leading symptom excessive thirst for cold water in large quantites is characteristic . 6. SARSAPARILLA 30-Sarasaparilla is best for dry skin when dry skin with wrinkles is present. Here the skin is dry to a great extent with a shrunken and shriveled appearance. The skin is hard and rough to touch. The skin also seems to be present in folds with wrinkles. 8. NUX MOSCHATA 200- Nux moschata is effective for extreme dryness on mucous membrane and skin. The tongue adheres to roof of mouth but no desire for water.